All pictures in this post courtesy of Rheged – no, I haven’t been up in a helicopter to take this! 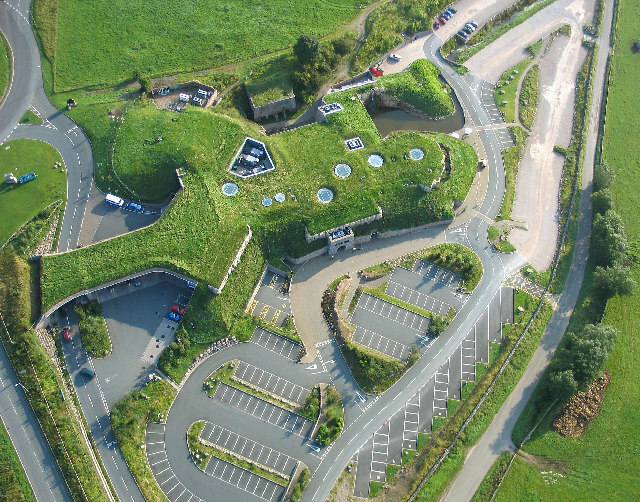 The Rheged Centre, which can be found just off the A66 outside Penrith, is an impressive and unusual building, designed to blend in with the grass landscape that surrounds it. The main entrance is vast and surrounded by stone – appearing to be set in a hillside, I would describe it as rather ‘castlesque’, with its heavy iron gates and imposing features. In complete contrast, the floor lighting and details within the entrance itself set the tone for the building’s interior, which is light and contemporary. Rheged is definitely one of the more modern and unusual landmarks in the North Lakes area, and I recently featured it in my top 10 places to visit on a wet day in the Lake District. Although it can be enjoyed at any time, for me a wet and miserable day is when it really comes into its own because it has such a large indoor space. The centre has a number of things to see and do, and is also well-suited for families with children. On the ground floor there are two cafés, one of which, The Taste Café, is also a large food shop stocking a range of food and drink by speciality and local producers. It has an extensive range of local beers and alcohol, and even a selection of English wine. On the same floor, there is also a sweet shop, an outdoor clothing shop, and an ice cream parlour which is supplied by nearby Abbott Lodge Jersey Ice Cream. The building is fabulously designed so that to access the second floor you can either use the escalator, or a beautifully curved corridor which takes you gently round through a series of glass-fronted shops until you reach the same level. The retailers sell a variety of local art and crafts, presents, beauty gifts and books. Peter Sidwell’s Simply Good Taste cookery courses are also run from his school at one side of the second floor, where students for the day can be seen working on their culinary creations. I enjoyed some of the smaller details that have been thought of in the building, including the art on show around the corridors and stairs. One such display featured hundreds of white paper mayflies by Cumbrian artist Katarina Prior, which were attached to the wall and ceiling, and produce a really special effect because of their sheer number. Rheged is an ideal place for families with children. It has a large indoor play room, as well as a creative zone with art and craft activities, and there is a huge outdoor play area for warmer days. There is the most enormous children’s shop too, which stocks many items from toys to shoes and is a riot of colour. We stopped to admire some fun elephant’s and sheep’s heads on our way through, which were made from textiles and mounted on the walls. Who says those are just for children?! The 3D cinema, apparently the largest in the North West, shows documentary films throughout the week, as well as a selection of children’s films on Saturdays. Although I didn’t venture in on my recent visit, you can visit the website for further details of what is currently on show and on which days. One of my favourite items on any day’s agenda is lunch, which we chose to have in the Taste café, one of three eateries to be found within the centre. I had a mooch around all the cafés and each offers a slightly different style of atmosphere and food, so there really is something to suit everyone. 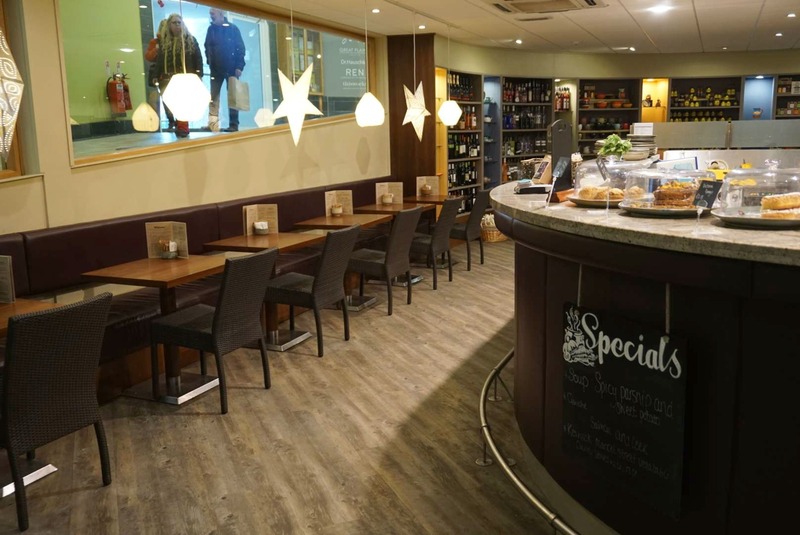 Upstairs, Café Pod serves filled rolls, soup, hot pies and sausage rolls, and the downstairs Peter Sidwell@Rheged Café produces full English breakfasts and larger lunchtime meals, with local beers and wine also on the menu. On the Taste menu, I naturally gravitated towards the toasted panini section, choosing a panini by local producer Patrick More, which came filled with ham and Eden Chieftain cheese, and was accompanied by a mixed leaf salad and relish (all for £6.25). The portion size was incredibly generous, with the cheese oozing from the two enormous halves of panini, which is just how I like it! The particular choices of ham and cheese really complimented each other in a way some just don’t. My companion chose the goats cheese tart salad at £5.95, which came as two filo pastry shells filled with goat’s cheese from Thornby Moor Dairy along with a large mixed leaf salad and chutney (the goat’s cheese is referred to on the menu by the rather adorable term ‘half a Stumpy’). Most options on the menu appear to be made using locally sourced produce where possible, and the dishes are very reasonably priced for the quality. Other choices include soup and soda bread, quiche salad, market vegetable or chicken curries, pâtés on speciality breads or bloomer, a club sandwich, and smoked salmon on rye with salad and lemon. I also fancied trying either of the cheese or fruit scones, at just £1.95 and £2.10 each. Drink choices include tea, tea infusions, hot chocolate, cold pressés and cordials, wine, British and local beers, and freshly ground Carvetii coffee brewed at the table (Carvetii is based near Embleton). I’m not usually keen on cups that are anything other than white inside, but enjoyed the quirky (presumably hand-made) green-blue mugs which are also for sale in the shop, as they are that little bit different. The only problem with such a large portion is that I couldn’t extend to one of the equally enormous and delicious-looking cakes and tray bakes on show under their protective domes – they even had a gluten-free option for those who need it. Fully restored after a leisurely sit and a natter, we ventured to the top floor to take a look at the gallery, which is accessed via a suspended walkway of wood and glass. The latest exhibition on show is Ian Lawson’s Herdwick: A Portrait of Lakeland, a collection of absolutely outstanding photographs describing a year in the Lake District and the life of the Herdwick sheep, as well as those who care for them. The exhibition is so good that I write about it in more detail in a previous post. The gallery is free to enter, which I find amazing as I’ve previously paid good money to see things that were much less interesting – this really is jaw-droppingly good. Another exhibition just to have opened is the Wildlife Photographer of the Year, which I went to see in a previous year, and can imagine is equally well worth visiting this time around. Again, exhibitions are always changing, so visit the website to find out what’s on when you’re in the area. I really enjoyed my time at Rheged, on what was a grey, horrible and damp day outside. Next time you’re in the North of the Lakes, or just don’t know what to do when the weather is bad, you should make a point of visiting. Our lunches at the Taste Café were exceptional and good value too, and before we were even halfway through, we were already planning which other chores and days out we would be able to combine with a revisit! Have you recently visited Rheged, and what was your experience like? Which other nearby ‘things-to-do’ would you recommend? Please do leave a comment for the benefit of other readers.